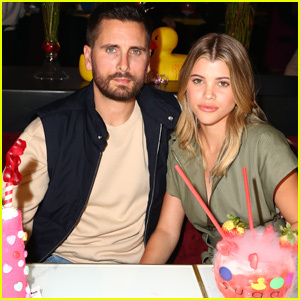 Sofia Richie & Boyfriend Scott Disick Take Their Romance to an Art Gallery | Scott Disick, Sofia Richie | Just Jared Jr.
Sofia Richie keeps close to Scott Disick at the grand opening of the Maddox Gallery LA! The model and the reality star coupled up for the event on Thursday (October 11) in West Hollywood, Calif. The two were seen holding hands while outside. Once inside, they snapped some pics with Kyle Richards‘ husband, real estate agent Mauricio Umansky. The event featured the inaugural debut of the “Best of British” exhibition. Guests also enjoyed light tray pass bites. ICYMI, last month, Sofia opened up about her relationship with Scott in a rare interview.